Manufacturer of a wide range of products which include high speed rapid mixer granulator machine. Mixing Bowl And Cover: in three section • The mixing bowl is fabricated with S.S. 316. The bowl is specially design in three sections. The flat bottom, mid portion is cylindrical and the top portion is conical. This design helps the machine to move efficiently. 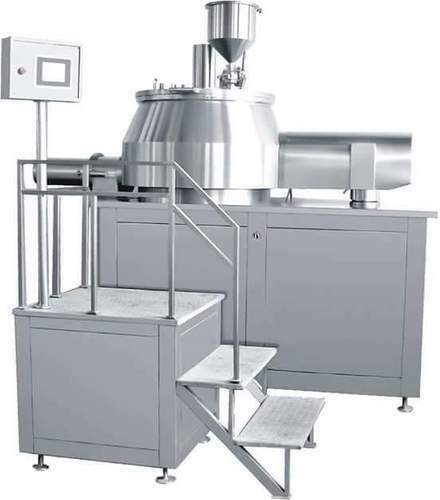 The machine is provided with the counter balanced lid. The lid is provided with the vents, charging openings and view ports. The Main Impeller And Drive: The main impeller is consisting of dual speed 750/1500 synchronous dual HP TEFC motor, coupled through a belt drive to a worm reduction gearbox with chain coupling. The machine is consisting of specially designed bearing housing to drive the impellers. The impeller does the mixing at the bottom and at the centre of the bowl. The inside wash facility is been very helpful for quick change over. The bearing housing prevents the leakage of the powder from the bottom entry. This design leads to longer life of the gear box. Chopper: The dual HP dual speed (1440/2800 synchronous) TEFC MOTOR is given for the chopper. The motor shaft is made up of S.S. The chopper is consists of 4 blade S.S. impeller. The assembly mounted in the bowl horizontally in which the shaft is integral with the motor.